1. Pre Heat Oven on gas mark 4/180C. Pre grease the tins with a little butter and apply a grease proof paper to each one ready. 2. Whisk butter and sugar together until soft, pale and fluffy. 3. Beat 4 eggs together in a separate bowl, add little at a time to the mixture. stir together. 4. Sieve half the flour and cocoa powder, with 1 tablespoon of water over the creamed mixture and fold it in. Fold in the rest of the sieved flour and cocoa and another 1 or 2 tablespoons of water. 5. Make sure it is well mixed and divide into 3 tins. Place in top tray of oven for 20-25 minutes (gas mark 4). After 20minutes, gently press the middle of the cake, if it bounces back up – it’s cooked. 6. Leave cakes to cool for 5 minutes in the tray before removing them. Turn out onto a cooling rack, and remove the grease proof paper. Then leave cool for at least an hour before decoration. 7. Whisk a full tub of double cream (600ml) until piping consistency (this should only take a couple of minutes). If you use an electrical whisker this will take a lot quicker so make sure to not over do it. 8. Take a layer of cake and spread 2 dessert spoons of Cherry Jam. Then spread the double cream on top as much as you think is necessary. Repeat this on the next layer. 9. Place the top cake on top like the picture below. From here, decorate it how you want! I smothered double cream all over the cake and covered it with Flakes. 10. 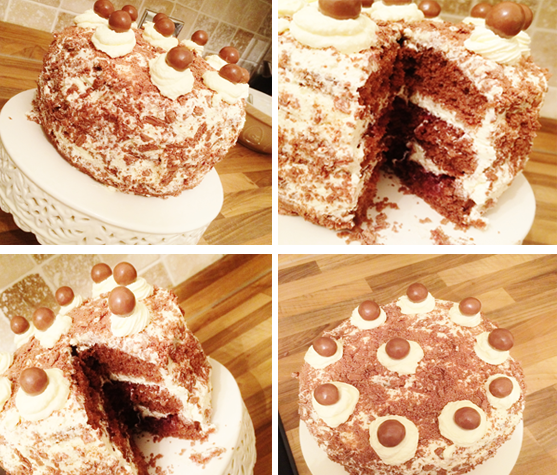 Pipe double cream on top of the cake like below, and add a maltesers on top of each one! This will keep up to 3 days, refrigerated.